Part five of the six-part series focuses on south-west Europe, including Spain, Portugal, Switzerland, France, Monaco, Malta, Italy and Andorra. For the eighth time in a row, the Catalan giants were no match for their counterparts in the Liga ASOBAL, as Xavi Pascual’s side secured their title with six matches to go in the season. However, Barcelona were not as dominant as in previous seasons, losing their first game in the domestic league after a 146-match unbeaten streak. The 29:28 defeat against Granollers was not a huge blow for the Catalan side, who won the title by a 14-point margin ahead of Abanca Ademar Leon, but underlined the erratic nature of their season. Barcelona saw their fate in the VELUX EHF Champions League sealed early after a tough loss against Montpellier in the Last 16. After a brilliant regular season for the ‘Lions’, which saw them record 24 wins, one draw and one loss, the final stage was equally impeccable. Great teams transcend themselves in the decisive moments and Sporting did not escape this rule, winning eight of the last 10 games and becoming champion against their rivals, second-placed Benfica, with a 33:27 win in the crucial game. Pedro Portela was particularly inspired in this match, scoring six goals: “Being a national champion is all that a player wants at the beginning of the season, and being a two-time champion has an even more special flavour. This title gives the possibility to play the Champions League, a competition that is the best showcase for any handball player,” said the right wing. The Portuguese Cup was conquered by Benfica, where the roles were reversed. The ‘Eagles’ defeated Sporting in the Pavilion of Peso da Regua, 31:24. Benfica right wing Davide Carvalho played a key role with nine goals. If the previous seasons had been a walk in the park for Paris in their domestic league, this one has been dramatically different. In fact, PSG had to wait until the very last day, and a crucial victory against Chambéry (30:26), to be assured of another national crown. 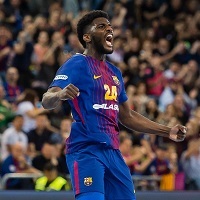 It was Paris' fourth consecutive win in the league and the perfect farewell for Daniel Narcisse, who waved goodbye to his handball player career. In December, Montpellier were still six points ahead of PSG, but their loss in Paris early February started to turn the tables. Both Montpellier and Paris finished with 45 points, but the better goal difference gave PSG the edge. Montpellier lost the title following a last-second defeat in Saint-Raphaël two days before the end of the league, but consoled themselves with the EHF Champions League title. VELUX EHF FINAL4 debutants Nantes finished third, while EHF Cup finalists Saint-Raphaël qualified again for the competition by finishing fourth. The only team from Monaco, AS Monaco, finished ninth in the French fourth division. They were on top of the table after the regular season, and they remained on top after that: losing only one of their 10 play-off matches, Wacker Thun became Swiss champions for the second time. They dethroned Kadetten Schaffhausen, 10-time Swiss champions between 2005 and 2017. Kadetten even missed the final series, as Pfadi Winterthur - with Czech EHF EURO 2018 top scorer Ondrej Zdrahala - were Thun’s opponent. But they were had no chance against EHF Cup Group Phase participant Wacker, who only needed four matches to win the best-of-five series 3:1. However, the third win was only decided by Luca Linder’s strike two seconds from the final buzzer. Winterthur did not finish the season empty-handed, as they won the Swiss cup final. After losing the domestic title to Bolzano last season, Junior Fasano took it back this year. After finishing first of the championship round, Fasano made it to the play-offs, in which they beat Pessano in the semi-final before facing Conversano for the title. Despite losing the first game away (26:29), Junior Fasano took back the advantage at home (26:18) before celebrating their third national title after winning the decisive game, 29:23. The title in the Men’s 1st Division went to Aloysians Prominent for the second straight year. With three teams in a tight 12-match race for the championship, Aloysians ultimately finished on 28 points, three ahead of each Swieqi and La Salle, who shared second place. Aloysians also edged Swieqi in the MHA Cup, winning that competition one point ahead of their rivals. The Super Cup at the start of the season had also gone to Aloysians following a massive 32:18 win over Luxol. Handbold Concordia left a strong impression in the Catalan regional championship, affiliated to the Spanish Handball Federation, by finishing fourth in their group of 10 clubs.